Historylinks Museum is grateful to Mrs Carol Haq and other descendants of Captain Rose for the donation of his diary, photograph albums, documents, uniform and accoutrements with permission for their use in displays and exhibitions. Capt. Rose was the son of Katherine Gilchrist of Ospisdale (Sutherland),who commissioned the stained glass window in his memory (along with one to his brother) in Creich Parish Church in Bonar Bridge. 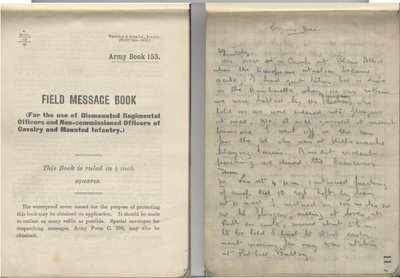 This version of the diary has been produced from a typewritten copy of the original, written in pencil in Capt Rose's Field Message Book. Images and maps have been added, Editorial additions, clarifying abbreviations and providing full 2008 place names, are in parenthesis and italics. This version of the diary commences with an extract from the Rose family history 'Builders of Empire - the origins of the Baldwin Family' by Michael O' Devlin and also contains factual detail acquired from other sources. "Captain Ronald Hugh Walrond Rose was the third son of Frederick William Rose and was born in London on 11th July 1880. He was educated at Scott's preparatory school, Kensington and followed his brothers to St. Paul's School. He was gazetted into the Royal Warwickshire Regiment from the Militia as a Second Lieutenant on 4th January 1899 and promoted Lieutenant on 17th March 1900. He transferred into the Cameronians (Scottish Rifles) on 20th May that year. Lieutenant Rose was gazetted Captain on 4th May 1905 and served with the 2nd Scottish Rifles until 10th October 1906 when he was appointed as Adjutant to the 5th King's Liverpool Regiment, a Territorial Force battalion, with whom he served for three years until January 1910. A shy and somewhat sensitive man, Ronald Rose was held in great affection by the officers and men with whom he served. He kept meticulous records of his service and travels as well as hunting diaries, which he illustrated himself. It was on the hunting field that he met his future wife, Hetty Fletcher, daughter of George Fletcher of Liverpool and sister of John Kebty-Fletcher, Conservative M.P. for Altrincham. They married at Eastham on 29th March 1910 and in their short marriage had two daughters. 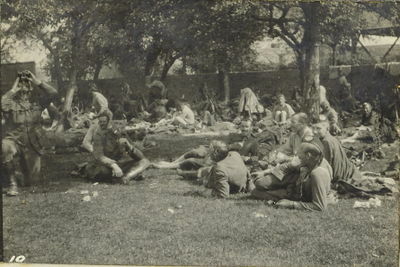 Shortly afterwards they travelled out to South Africa so that Ronald could rejoin his regiment, the lst Cameronians (Scottish Rifles), which was stationed at Bloemfontein. 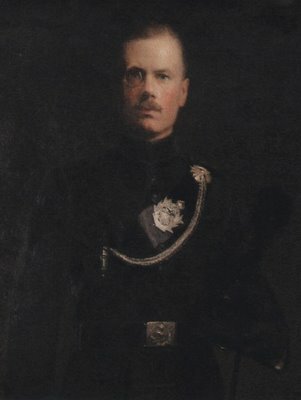 The Battalion had embarked from England for India in 1894, where they remained until 1909, when they embarked for South Africa Nine months after his arrival with the battalion, Captain Rose was appointed Commandant of the South African School of Signalling at Pretoria, where he and his wife took part in the social life which revolved around Government House. In 1912 the Roses moved to Glasgow with the regiment when the 1st Cameronians moved into Maryhill Barracks"
We were in Camp at Blair Athol when the European situation became acute. I had just taken Lee [Captain Harry Hylton Lee, Cameronians, Commanding A Company] [for] a drive in the Humberette when on our return we were halted by Davidson [Lieutenant Davidson, Medical Officer 1st Bn Cameronians], who told me we were ordered into Glasgow at once. We at once guessed it meant business. I went off in the car for the Col.[Colonel], who was at Killiecranckie, playing tennis. Amidst violent packing we dined the Camerons. A long series of political moves culminated in the outbreak of the war between the major European nations. In 1883 the Triple Alliance of Germany, Austria-Hungary and Italy came into being. This was matched in 1907 by the Triple Entente, comprising France, Russia and Great Britain. Italy and Britain did not commit themselves to engage in war automatically with its declaration by the other powers. Following the murder of the Austrian Archduke at Sarajevo diplomatic action failed to prevent Austria-Hungary declaring war on Serbia on 28th July 1914. Russia, Germany and France in succession mobilized. The Triple Entente could mobilize 62 French and 112 Russian divisions against the 87 German and 49 Austro-Hungarian divisions. It was known that the Russians could only concentrate slowly hence the German plan was focused on rapid destruction of the French army, before the Russians could come to their assistance. The German plan was a double envelopment of the French forces, with the main thrust on the right flank, sweeping through Belgium to the west of Paris. On 2nd August the Germans demanded free passage through Belgium, leading to a,British ultimatum of declaration of war if the Germans violated Belgian neutrality. Rose at 4 a.m. continued packing of camp till 10. 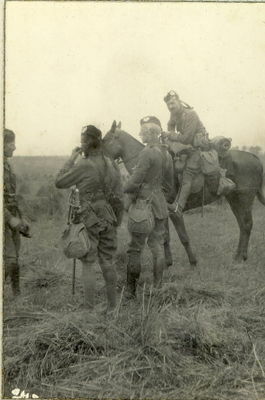 Regt, left by train at 11, and I motored in 100 miles or so to Glasgow, calling at Gves at Perth on route, arrived about 5 p.m. to be told I had to start early next morning for my war station at Porthill Battery. Arrived at Porthill, at once made my dispositions to protect the fort, and set remainder of men to work improving the defence with wire entanglements. Our own food arrangements were of the most primitive. Much annoyed by a Bat-eared Subaltern of the R. E. [Royal Engineers] Reserve. However, I squashed him fairly badly. Visiting sentries all night. Rushing the men on with work, training continuously all the time, not very much food. Sleep in small casemate. Felt rather like a ship. Telephone to Hamilton. Led the R. E. boy through the wet grass, I being in gum boots, to his great discomfort, he now very subdued. Still at work on defences, doing 8 hours a day, besides sentry work at night, men work excellently. Wired to come in to settle up mess, accounts, etc., delighted. Settling up mess and my affairs, met Hetty [hereafter in the diary referred to as H.] at 2 p.m. delighted to see her. Babies well. mobilization 1st day. Very busy with mobilization. Blundell [Private Blundell batman] packing up my quarters as everything has to be removed from barracks. See H, in my quarters when any spare time. Went over to her at Benisons after mess, always leaving telephone number return. 3rd day of mobilization, which goes smoothly, but very busy, also very busy with accounts of mess. Company now looks like a battalion. Mobilized, but very busy closing accounts. Dined with H. at Central. Still busy packing, private affairs, and mess. Route march, told nothing. Ready now, lunched C.O. [ Commanding Officer Lt Col Philip Rynd Robertson] and Mrs at Central, dined with H. do. Ready, dined Central, greatest secrecy about our movements. Seeing all I can of H. Dined Benisons, who are most kind. Dined with H. at Central. Saw H. off at 2 p.m. Left Glasgow late at night from Maryhill station. Embarked on SS Caledonia. Fine Anchor Line ship, very lucky, as many in pig boats, not told where going. Fine night, searchlights going all along coast, fine sight. Up at 5 a.m. but hung about in shed all day. Pouring with rain. Fed on ship. In evening marched off five and a half miles to No. 6 camp at Frilléres, rain which held off a little, started pouring again, arrived wet to skin. Now began some of the discomforts of war. Transport not in, so could not get even the little bit we are allowed to carry, but managed to be very cheerful. In tent with Drew [Lieut Cecil Francis Drew, Platoon Commander B Company] and Newman [Lieut Edward William Polson Newman, Platoon Commander B Company]. Went out to help in transport. Very dark, raining, up to knees in mud. Got transport in about midnight. Got valise and lay down in dry clothes. Eat some food brought in haversacks, and being dead beat slept quite well. Still pouring, camp a vast sea of mud, men wonderfully cheerful, got best of food, and eat with clasp knife. Weather improved, dried clothes. Went into town in afternoon, and bought more food, came back to find a crowd of people braving the mud to see us. All very friendly. Left at 10.30 p.m., destination quite unknown, and marched to station. This proved an arduous job, and the men got dog tired. Arrived at station at 12.30, and had some coffee. Men packed into train like sardines, but only four in our carriage. We feed as best we can, clasp knife very useful. All day in train, country very deserted, chiefly women and children, people getting wildly enthusiastic, violent cheering at all the stops. Received seven presents of ham, tea, pears etc. Wild excitement. Train very long. Arrived about 7.15 p.m. at Busigny. A wonderful reception awaited us at Maretz. 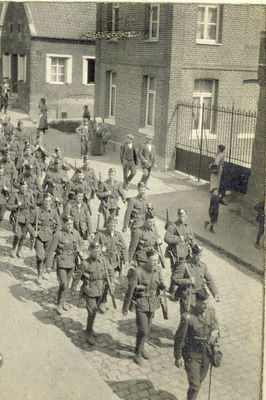 The Battalion, after waiting about at the station for some time, marched about two miles to the Town Hall, where we formed up in front of the church, amid much cheering. The officers then entered the Mairie, which was decorated with the Allied Flags, and we were duly presented to the Mayor, who read us an address in English, this being followed by an address in French, read by a little girl. After this we were all presented with bouquets of flowers. We then marched to take up our billets. This was a long job, the men going in small parties to houses fairly widely distributed. About midnight I got back to the Mairie, and eventually got my own billet, which was with a weaver. Blundell came with me, and was accommodated in the same room. I had a nice bed with clean sheets. Blundell a paliasse. The weaver then gave us some wine, and so to bed about 1 a.m.
A day of rest. Up at 7.30, then went round and visited all the billets of the Coy. [Company]. Tried to impress on men the importance of good behaviour. Everywhere the greatest kindness. I find my knowledge of French of the greatest importance. I am inclined to have a nasty throat, and feel a bit headachy. Lunch at a caffée [sic], and to dine at same. Throat rather nasty, nothing much doing, translated some telephone messages. Was told I might have to assist the French billeting officer, so went to see at Busigny, but was not required. Parties going out on fatigue during night. Went for a route march, much pursued by all the girls in the villages, who decorated our men with flowers, and try to take their name plates. Very very hot. Very good maps have been issued. Throat better, rash on hands. I have arranged to have our meals at the house where Newman is billeted. The owners of the house (and indeed everywhere) were almost importunate in pressing us to drink wine, and eat with them. It is most difficult to know how to refuse without giving offence. The country round here is covered, chiefly with corn, beet, and potatoes. The chief industry is weaving, embroidery and tissue, many of the houses, of which my host's is an example, have a hand loom set up. None of the people in this village can talk English. Dogs are not allowed out, unless muzzled, one sees none in the streets. On going to our caffée for evening meal, found I had to go out, after meal Lee in state of great enthusiasm detailing parties. I to go at 3 a.m., so off to bed. Paraded at 3 a.m. very damp mist, marched to Busigny, entered train at 4.40 a.m., getting light. Had some tea and dry bread with officers of A.C. [Ammunition Column]. Arrived about 6.30 a.m. at Joumont right on Frontier, unload the AC quickly, with help of turntable. Then back to Hautmont, mist clearing. Got my men billeted very comfortably, thanks to help of French Artillery Officer. Had déjeuner, met Capt in Bedfords, who wanted to join Aeroplanes. French Civil guard offered to take him, if I would care to pass him back. Went with him in car, great preparations in fortress of Maubeuge, heard here that Germans interfering with our concentration, so shifting L of C [Line of Communication] north. This made me anxious to be back. So did not stay long near aeroplanes. 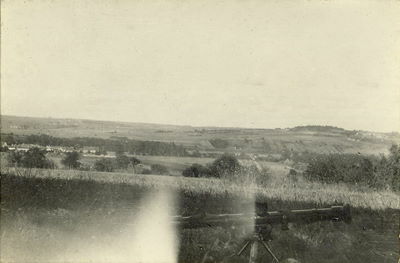 Place full of French soldiers, infantry and cavalry, houses being blown up to clear field of fire. Got wire when back to say must get back to Maretz before 7 a.m. So no bed again tonight. Dined with French officer, who spoke only French. Could not get my next A. C. unloaded till midnight, as no facilities, and very heavy, men work splendidly. Very cold in train going home. Got to my billet about 3.40 a.m. people knocked up quite easily, and very pleasant (chemist refused money). Throat rather bad. Left at 8 a.m., marched to Quarouble, where we had just finished billeting, and where I saw the prospect of a lovely bed and food, when we were ordered off as hard as we could go, to line the Condé - Mons Canal. This was through pretty country. We passed through French Cavalry peeping round corners. The roads are very trying to march on, all being pave. Men very thirsty and water bad. We are without Artillery or Cavalry. 'A' Coy. Load rifles, one rifle goes off, not ours. Settled the men at a coal mine. Put out picquet under Drew. Had some beer. Tried to sleep in some hay, peculiarly hot, guns going all day on our right. Money [Lieutenant Robert Cotton Money Cameronians, Battalion Headquarters - later Major General d.1985] came in to say our right hotly pressed, did up valise and put it on an S.A.A. [Small Arms Ammunition] cart. Don't know what has happened to our transport. 2 a.m. told we must clear off as fast as possible. Hear that Middlesex have lost one officer and three men, but driven off enemy. We had to make a flank march across enemy's front. CO very anxious because 'D' Coy delayed. Got away all right, but 'D' Coy, officers lost their kits. Dawn finds us marching, no food. Pass into Belgium, see everybody who can clearing off. Guns getting louder. Come in sight of battle. Shells bursting (Battle of Boussu - our rearguard action). 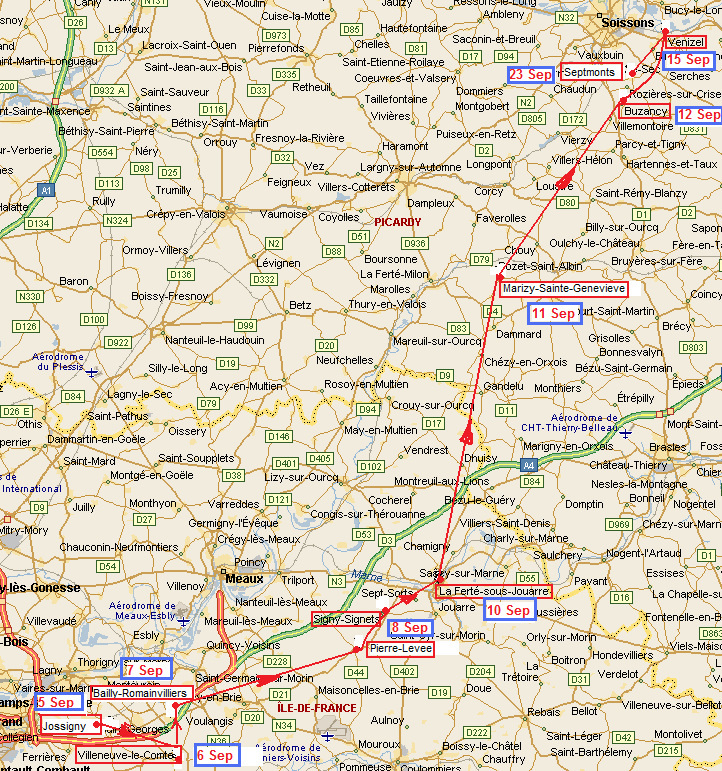 Thought we were for it, but no, marched away through Baisieux back into France, thence via Sebourg to Jenlain. Rest at Rombies, men very tired, and hardly any food, men loot apples. Our Brigade is 19th : A S H [2nd Battalion Argyll and Sutherland Highlanders] R W F [2nd Battalion, the Royal Welsh Fusiliers] Middlesex [1st Battalion, the Middlesex Regiment], ourselves. On the way saw battle from distance, wood in direction of Quievrain being heavily shelled. Men throwing away their kits right and left. Halted for some time at a farm for men to rest. Then continued our retreat to Jenlain, where we halted at a picturesque farm, after which we went out and entrenched ourselves. This took till after dark. However, we only stayed till 4.30 a.m.
Hard march with firing all round, anxious as to whether we will be cut off. Aeroplanes. Apparently very close shave yesterday, one platoon of A.S.H. [Argyll and Sutherland Highlanders] killed outright bar Cpl. [Corporal] and two men. Riddell [Capt Thomas Sheridan Riddell-Webster, Battalion Headquarters],had narrow escape. Find we are bound for Haussy, where we met main army. Saw Cavalry being shelled, met Rasch ? Came under little shrapnel, when we formed to cover Cav. [Cavalry] retirement. 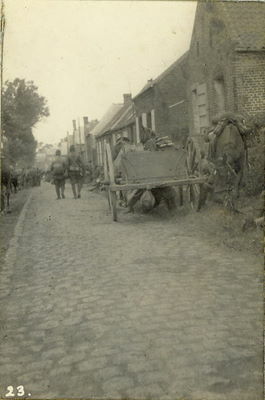 Retired amidst crowds of troops, (via Solesmes) on Le Cateau, Pavé, very very trying, troops nearly beat, billeted at station about 10 p.m. Got some beer and tinned beef. Very pathetic to see crowds of inhabitants fleeing. I was leading just as we were about to extend into action, when a motor cyclist dashed up, and we were ordered to halt. Apparently we were now wanted on our right flank more, so another huge long march in front, the time now about 2-30 p.m., about 4-30 apparently the R. [right] flank gave way before we could reach it, and the Cameronians and the Cav. were to join the rear guard. We accordingly started in the orthodox manner, and retired on Maretz. During this movement we saw a battery which had been reduced to two guns firing away, then it retired, and after a while saw some of our Cav. patrols, which I distinguished through my glasses, so warned our men not to fire on them. On reaching Maretz, picqueted all the entrances against cavalry, and waited for rest of people to pass through. Frequently heard firing, this was some troops on the right firing on our cavalry, they killed about three, and forty horses, their officers, when they got through seemed nervous. Talked to some cavalry officers. One of these had been down to Busigny (in error) where he met some Ulans, he shot two, and then retired. They were sick about being shot at. I borrowed a horse, and rode back through village, now quite dark. I had to be very careful, as my men would have fired for twopence. Saw CO and told him how anxious the Welsh were. Feeling rather full of buck, rather hope for a chance at their Cav. About 9-30 awful march now begins. Numbers of wounded lying out on bank. Germans have burnt one of the hospitals, full of wounded, let us hope an accident. March on, and on. Have to halt parties of our own cavalry occasionally, party with bayonets fixed, and revolvers ready. On - on - always on, men at last can stand no more. Let us hope they will not be killed, as many stragglers have been. On - on - men half asleep, and constantly dropping, exhausted. Regiment now no more than a rabble party, drop down at Estrees.
" Being now many weeks ago I may tell you a little about the battle of Le Cateau. The day before, we had joined the main army after acting as a flank guard to the main army (I refer to the Brigade to which we belong); it was here I first came under shell fire. I took up a position to cover some retiring cavalry -the shells were short but the noise they make is unpleasant. In this case you saw the flash of the gun, then the flash and bang of the shell bursting, then the whiz of the bullets and the patter when they strike the ground. We got away from this in an orderly retreat, now mixed with the main army. We retired through a large town which was heavily shelled just after we got out. Then came Le Cateau. We were put in a railway shed for the night and moved out at daybreak. As we moved out Ulans were firing round comers of the street and we had to put picquets at each turning. I was glad when we got out of the town. We formed a reserve and had a grand view of the battle." Sleep half an hour, wake with cold, can see no officers, decide to get regiment on at this point, find other officers, go round, and kick men up, and start them on. So difficult to keep awake, and not fall. Seem to see houses at side of road, daylight breaking, but still on - on - on - just a rabble of all sorts of regiments. Pass some food lying about, grab some. Men have been almost without food for two days, fed self largely on bread, raw turnips, etc., my feet excellent. With daylight things a bit better. Col. [Colonel] halts head of column, and we now struggle in a partly formed body, feel much less sleepy in daylight. Reach St Quentin at last, ? give men some tea, but told we must push on at once, 11 a.m. as town will be shelled at any moment. Many shops still open, get coffee, no milk, and bread, and buy chocolate. Rather anxious getting out, want of sleep makes one rather nervy. March on, and on - it seems for ever. At last we bivouac at Ollezy. One has got distinctly nervy. Breaking up a box sounds like guns (I hate the sound of guns). A motor bike is a machine gun. We have to furnish a picquet of 50 men. The night is dark and wet, but by getting under straw, and huddling together, we are able to get about 4 hours sleep, which is more than I have had for over three days. Riddell jibbers through tiredness. Sleep is broken, however, the ground is soft, some horses draw their pegs and stampede, there is a painful wailing from a poor fellow, who has had his face crushed in, others are injured. Order is restored, and I sleep a little. About 4-30 we get up, to stand to arms. We are to relieve the outposts, and then act as rear guard. All bridges over canal have been blown up, excepting the one we cross to take up our position. We march out over a mile, to a flank, but nothing happens. We get news that our efforts at Le Cateau have been successful. The French caught some Germans in the flank, it was our trying role to draw them 60 miles South, and then hold them. So we go on our long march rejoicing. No need to blow up the bridge. We tell inhabitants the good news as we pass, After breakfast we march on slowly. A long halt in the middle of the day, unfortunately not near water. I take turns at riding a stray horse, the most sore-footed of the men are lifted on the carts. Several of the officers have stray mounts, which they ride in turn. As the day closes in it gets very stuffy, and we cannot prevent the men from packing up 10 abreast. At last we reach Noyon, 9-30 p.m., but alas! It is another nightmare. The administrative arrangements seem to be of the worst. We wait, and wait. Columns of Artillery, infantry and cavalry, all mixed up in the same road, gradually crowd forward with interminable halts. The wretched man on foot has but a poor chance. Newman who has a wonderful nose for drink disappears for some minutes and then returns with two bottle of wine. At last we get to our bivouac (Pontoise) [Pontoise-les-Noyon] , and are rejoiced to find tea and soup awaiting us, and best of all, Wood [Hon Lieut George Wood, Quartermaster], who was thought to be killed, has turned up with the bulk of our kits. Last - but not least - we have a mail. Lee very happy. A day of rest, but as the day goes on we hear continual firing. In Noyon the town is being evacuated, and the bridge at Pont L'Eveque prepared for demolition. Lee and I go in to Noyon but can get nothing. As we pass the station we see a captured German officer, who seemed very calm. Il a encore l'air d'un trognon! ["He looked totally dejected"] He is under an English guard, which is as well for him. As the afternoon progresses, a feeling of strain seems to envelop everyone. What is happening? Why have the guns stopped? Oppressive heat. Our long retreat is having an effect on our nerves. Rumours of all sorts begin to float about. We realise the rottenness of the administrative arrangements. We hear we are to entrench, then about 6-30 p.m. the order comes to move, but only about five miles to go into billets. I am sent on to arrange the billets at L'Aigle. Get there about 9 to find 1,000 odd men are billeted in squalid village of fifty inhabitants. I do what I can, however, the regiment does not turn up. Apparently the roads are hopelessly congested. The A & S H eventually do, but no sign of ours. About 1 a.m., I lie down for an hour, when I am aroused by a loud explosion. Probably one of the bridges going. I decide to attach myself to A & S H whom I assisted to billet night before. Orders come to move about 5 a.m. Get some hot coffee from shop, and biscuits. All mixed up with transport, the brigade is doing rear-guard. Move off as last, and after passing Carlepont came up with Cameronians. March some distance, and then have a meal, the tea seems excellent. It has been made in a canteen which is dirty with past meals, a scum of grease on the top, and there is no milk, but we find it finer than any tea we have ever drunk. The chief feature of the day is the excessive heat, which is rather distressing. We have a long halt, and hear firing. The country changes from wooded and flat to rolling downs, with few villages and large farms, then hilly and wooded. About 6 p.m. we get to Attichy, near which place we get a clean field, unlike the filthy spot we had for our rest day. We hear good news, and receive the complimentary orders of the French, the Govt., and the Fleet. Tea with condensed milk. Get quite good meal of stewed vegetables, bully beef, stewed apples, and bread and cheese. Rise at 4 a.m. After six hours' sleep, the best rest for some time, as only disturbed once during night. Breakfast of tea, bread and jam. Fall in about 5-45, and stand by till 7-30. I have a sore toe pad on each foot, and feel rather slack. This is reaction. The 5th Division, to which we have been attached, are going to have some time to refit, so we are going to be attached to the 4th Division under General Snow. We belong to 2nd Army under General Smith-Dorrien. We march the whole day through the Forest of Compiègne. The heat is very great and breathless. No water can be obtained to drink, though the whole place is moist. About 6 p.m., very tired, we reach St Ouen, and after dark I hear we are to take up outposts. No water, little food. This is trying, very trying. It soon gets cold. There is a good deal of firing. We are in reserve. Four of us huddle together to keep warm. It is very wet with dew. A miserable night, with hardly any sleep. Too cold. We retire into village St Sauveur (near Verberie) in a turning, about 4 a.m., and then wait there. We hear violent firing about 8 a.m., and then move out. There do not seem to be any orders, but an R.A. [Royal Artillery] officer asks CO to assist him. We go up a steep hill, and extend for action, but nothing happens. Expect attack every moment. Apparently there has been a cavalry raid at Nèry ? They got their guns up unobserved and fired on the L. Battery. They have been cut to pieces. We manage to get back a bit, capture several guns, and capture prisoners. Enemy clear right off, and after a long wait we retire through Tronerilles, Rully, and Fresnoy, where I find we are again for outposts. On the way we pass the place where the deed was done. It is a little corner of hell. They are shooting the wounded horses. The men have been removed. The road is covered with blood trails. I have felt rather exhausted today. Lee shares his horse with all in the company, which is generous of him. I rode a couple of miles. During the evening, while we take up a good outpost position, there is the sound of heavy firing. We see the flashes of the guns. A village about 4 miles off is set on fire. An aeroplane occasionally passes overhead. What is it? We get an issue of rations, bread, biscuits, bully beef, tea, sugar, and bacon. Fires not allowed. The only water we can get smells very nasty. 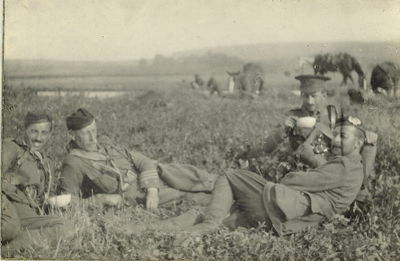 The men take their sugar and tea in their caps. It gets very cold indeed. A little firing during the night, probably someone jumpy. I get about 30 minutes sleep, too cold for more. Village light sky all night (Firing was by A Coy. at Ulans). Very cold. Retire a bit to hold position further back. The unfortunate badly * staffed infantry bde [brigade] seems to do nothing else. L. v. z. with good cause relieved. * BM [Brigade Major] killed at Le Cateau ( ? ? ? ) ? ? ? ? We are a strange-looking crowd now, men and officers unshaved. The men, who love to be as unorthodox as possible have taken every opportunity. Many caps are lost, and ………….. (At this point I was interrupted, owing to French cavalry being pursued a distance by Germans. We opened fire with Maxim, and Germans cleared as fast as they could). However, to continue …. comforters and caps of other units have taken their place. Equipment is extremely dirty, and all kinds of odds and ends in the shape of blackened canteens etc., are tied on. Some have cut their trousers to shorts, and some have French colours in their caps. Knives and spoons are inserted in the putties. It is a beautiful cool morning, so I wish we could get under way. No water, so our breakfast has been dry biscuit, and about a tablespoon of tea each. We spend the whole day on the march, halting, and then shuffling forward. We are harassed by German cavalry, and have to take up positions on the way, one time entrenching, at Eve, to help the cavalry, but nothing happened. The torture of the day, which is broiling hot, is dust and thirst. We cannot get water. All the villages are deserted. At intervals one passes dead horses. Men try to eat unripe pears and apples. Anything to slack their maddening thirst. The dust makes my throat very bad. We pass through Bures, which has a quaint old church. The villages seem very squalid. About 7 p.m. we arrive at Dammartin [Dammartin-en-Goele] and camp in an orchard at a fine farm. Feed, sleep till 11-30 p.m. (Place shelled soon after we leave). Start about 12-30 a.m. to march to Lagny, the torture of the day is trying to keep awake. Feet very sore, very tired, very dirty. People beginning to fly from here. Arrive at Lagny about 8-30 a.m. a fair sized town on the Marne. As usual, no staff arrangements as to where to go to. Messed about till 2 p.m. into a fair bivouac (Chanteloup) [Chanteloup-en-Brie]. I must now make brief notes only, or my book will be exhausted. Exhaustion, depression as to the situation general. March at 11-30 p.m. Arrive Grisy [Grisy sur Seine] at 9-30, not a bad march. Men in bivouac, we also in part of rather nice house. Nasty cough, and sore tongue. Good pears, sleep in garden under peach tree. Drew sick. "...Our retreat is now old history so I suppose we may now talk about it. It was a trying and strenuous time and soon sorted out the weak from the strong. It was felt that the country behind was infested with Ulans and they had a name for slaughtering any defenceless stragglers, so this was a good inducement to go on. As a matter of fact our performance was I think a most exceptional one and will go down in history as one of the quickest on record for so large a force. The force I was with was several times in great danger but the Germans never realised their opportunity and utterly failed. The whole operation was I think rather fine as at Le Cateau the British force faced enormous and increasing odds and so hit the enemy that they could not bring an overpowering pursuit and in excellent order we withdrew our army from a position, which, had the Germans been really thoroughly efficient, (as well trained as us), would have been almost impossible. I was very strong and well throughout and my feet gave me no trouble, as was the case with some of us. Providence always seemed to watch over us, once or twice I had made up my mind that I was unlikely to see home again but each time the Germans, through over caution or inability to keep up let us back into safety." Rise at 4-30, end of retreat. March 5-30, retrace our steps , hot and dusty. About 12-30 arrive at Jossigny, where we halt in sun till 3-15, have biscuits, jam and bully. We are told we have a chance of getting Germans in flank, in combination with French. March 4 miles to Ville-Neuf [Villeneuve-le-Comte], halt, have a small piece of freshly killed sheep, first fresh meat for some 10 days, also some milk in tea, an almost forgotten luxury. There was firing to our right most of the day, I fancy against French. Slept in straw. Rise at 5. Breakfast, was kept awake a lot during night by cough. Firing going on steadily to E and SE. V is a bad pessimist. Censoring letters. Weather is perfect. We are in a pretty country. Many apple trees line the road. A battle seems to be developing. We are standing by. I see the aeros. going out to either flank. I think division is in front. Push on to Roman Villiers [Bailly Romanvilliers], where we halt, and hear that Germans have slipped away. March on hard. Very hot and dusty, dust several inches deep. 'B' Coy. Is A.G. [Advance Guard] Halt at Roman Villiers for a good time, had lunch, bought bread and chocolate. March on, and on through Coulands Seensy to Haute Maison, where we arrive about 6-30 p.m. Infantry fire, and shells are fired at us. We have marched into German cavalry, who clear off. We form outposts, pass one of the most unpleasant nights I have ever spent. Intend to lie down a bit, Begin to itch very badly all over, intense irritation. At last lie down in cemetery, which has been loopholed, and get about 30 minutes' sleep. Stand to arms at 3-30, kick men up. Told we are to attack. Take place in firing line, and wait for daybreak. Nothing happens. See our cavalry and aeros. go out, then form up and march on a few miles to Pierre Level [Pierre Levée], where we halt to breakfast. This consists of ½ a biscuit, some bully, and some chocolate - also water. There is a vigorous battle going on to our left NW, probably German ?? Our halt is in sight of German bivouac of night before. Find German papers, etc. We now enter the disease range, the dead horses we pass smell dreadfully, and no attempt seems to be made to clear them. Dawn was fine, but fear it means rain. The French Chasseurs are very picturesque in their blue uniforms. After a dusty march, till 11-30 a.m., suddenly the troops begin to move out, and take up preparatory formations near Signy-Signets, on some open ground, to which the country has now opened out. 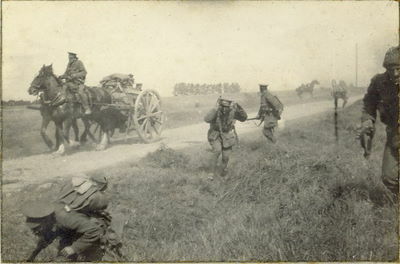 Suddenly, bang, bang, bang, and the enemy's shrapnel begins to scream over us, the 1st line transport, which has gone too far forward, gets shelled, but is soon stopped. Several shells, or rather their contents, fly over my little party. Apparently very near. Then our guns begin, and the battle gets going, and continues till about 1 o'clock. Then the enemy's guns slacken, but ours seem to go on. It is very hot indeed, broiling, and no shade. They begin to get back the wounded, not very many. C. Coy. has had most of it. Money got his leg braised by a ricco. [ricochet] I rig up some shade, we are hungry, and eat a tin of bully beef, no biscuits. Don't know what's happening, but see we are getting up some rations, fire seems to have ceased, time 2-45 p.m. This place is called Signy Signets. We stay the rest of the day halted, much firing goes on, to both our right and left. The Germans have blown up the bridge over the Marne. We have had some rain, which will make things cold tonight. After quite good night, leave bivouac about 6-30 a.m. to relieve Middlesex, who are holding posts on hill in front. As we come up, come under shell fire. Move into positions held by Middlesex, there is a good deal of shelling, but not much near us. Ferry [2 Lieut Ernest Leslie Ferry] wounded. The battle opens out, and guns are going all along the line. About 11-30 the Germans begin to leave, it is interesting to watch their movements. Our guns shell village, which seems to hold hostile battery, but it does not seem to mind. This place is thick with wasps. I have rather troublesome indigestion. The retreating Germans are shelled on all sides. A wooded hill on my N front still seems to hold out. It is dreadfully hot sitting in sun. Good deal of rifle and machine gun fire round wooded hill. I hear Ferry has been hit in arm. As sun goes down, shelling still continues. We remain in position as outposts. I have eaten and drunk nothing all day, and feel better for it. Very uncomfortable night, as if I put head near straw, cough badly. Feeling weak, but better. We are to retire from firing line to support. Eat a little breakfast, and feel fairly well. It has been raining mildly since about 3-30 a.m., when we stood to arms. Lee has shaved, but I shall not. It is now over three days since I had any clothes off. Move to reserve, have a little breakfast. Rest two hours, move off at 8-30 a.m. March after Germans. Pass through La Ferté Sous Jouarre, and over pontoon, see broken bridge, which had been shelled a good deal by us. Did not show much damage, but holes here and there, and chimneys off, many windows out. Over the rolling wooded country, and squalid village tract, people glad to see us. Traces of Germans now. Dozens and hundreds of bottles all along the road. Germans are moving very quickly. Day improving. Feeling very weak, but ride a lot. 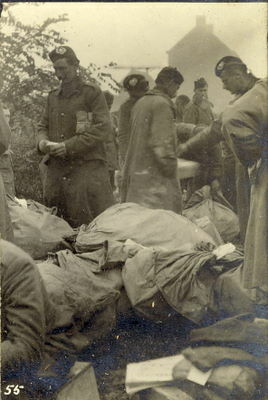 All kind of debris, hundreds of petrol tins, broken bicycles, even broken motor cars and carriages, German papers, etc. See great many of our aeroplanes at close quarters. Lots of high smelling dead horses. Glad to see that peasants are burning and burying some. Pass lots of live shell, also fine insulated telephone wire. Am able to eat a little lunch, find march very tiring. About 6 p.m. arrive near Coulants, where we bivouac, and have bully beef stewed. Ambulance fired at. A nasty cold night, unable to sleep much, owing to very cold wind. March off 7 a.m. Pass a few German prisoners. Good news all round now. A few pessimists still about. Raining and cold. Shell marks on road. Send off post-card to Hetty. 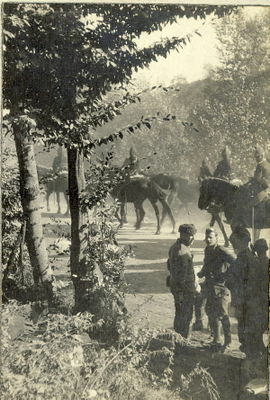 12-11 Army said to have taken 1,000 prisoners, much transport and machine guns. We hang about a great deal on the march, and only do about 11 miles. During the afternoon it pours with rain, and all are wet through. We go into billets after much waiting about in Maritz - St Genvieve. The woman of the farm is most disagreeable, believe her to have some connection with Germans, as they have lots of cattle and horses. All the women seem disagreeable, not so the men. I fancy some of the British have behaved badly. It is to be expected coming from a low class. We hear some nasty tales, unfit for publication, of treatment of inhabitants in some places. In others the Germans are most orderly. Most of the officers sleep in one room. We can dry our clothes to a great extent, but not our boots or puttees Buy a duster as handkerchief. Hear of many prisoners taken. Get about 5 hours sleep, best for long time. A mail comes in, which should have come long ago. The men are better since they have been shelled. One grows to hate the soldiery, they are utterly improvident, filthy and much like beasts. They were billeted among the beasts last night. There are unrecognised heroes amongst them, men who are always cheerful and bright, but others are a constant source of irritation, and behave more like monkeys, if you take your eyes off them for one minute. I am so glad Hetty got my boots done so well, I don't know what I should have done without them. Start about 6 a.m. and move out a mile, then wait. The war is largely waiting about. The roads are very muddy now. This should be bad for those we pursue. Money got a lot of German dubbin, which will be very useful. We are in for much rain now. It is very nice getting mail, one cannot say how much so. I took off my boots the first time for four days last night, but it was nasty getting them on, and till I warmed up. I am now "bearded like a pard". The mounted officers who can carry more look cleaner. The contracts for food seem to have been well distributed, especially in biscuits and jam. They are good. All the tinned meat is 'Frey Bentos' at present. Guns going again. We should have a scrap today, as we must be getting near another river. With all their dead horses, this rain will be bad for the Germans. Wonder when I shall get a chance of sending off a letter. Does not seem to be any. We wait about till 12, then march hard. See a big battle going on on our left. Good deal of rain closing in. Steady rain, and high wind, as dark coming on. Got in to Busancy about 6-50 p.m. and go into very bad close billets, officers in hay shed. Got some nice plums. Country has been cleared out by enemy. No food obtainable, sheep, etc. killed. Fair night, but wake with cold about 3 a.m. Rise at 5 a.m., for small breakfast. Standing by. Send off P.C. [postcard] and letter. Guns going hard. Quite a nice morning standing by, manage to get a complete wash, first for four days, also a shave. Go to church, which last about 20 minutes. Then go to have a meal, but just begun, when we receive orders to move at once. Was hoping to see our kits, and get some underclothes, men to get boots. Put some German dubbin on boots. I form part of A.G. [advance guard], and head brigade with CO's map about 5 miles to place where we are to bivouac. Just above Carrière L'Eveque. Weather nicer just now, but wind cold. Germans are shelling front crest of this ridge with high explosives. Went out with Lee to post observation group. Many spiders. Our planes complain that they are often shot at by our men. ? look untidy ? behave badly. Cannonade goes on well into night. See aeros dropping petrol bombs. Sleep in a German trench, quite warm. Visit posts about 12-15. Call in post, and move off. Rain begins one of the most miserable dawns I have ever known. Feel like others depressed, suffer much from cold. Sit several hours in a ditch. Our troops meet with check apparently. Day clearing a bit. Rain stops. Biscuits and jam. Bacon at 1-30, and slice of bread. Feel better. We now come under high explosive fire, one shell pretty close. You can hear them coming some time ahead. Rest in wood, we are in reserve. Lee lends me his woolly and I feel much better. In the evening we all feel much better, and spirits go up. Eat stew at 7, bully and potatoes. I eat enormously. My throat is sore, Another miserable night, rains heavily, cold wind. Arrive at 12-30 a.m., and cross Aisne at Venizel, move into wood, which we are to hold if 4th Division has to fall back. Very depressed, hear things are not going so well. Very cold, very damp, cold feet etc. Have to remain very quiet in wood. Fearful battle going on, infantry and artillery. Some shrapnel burst in our wood, also high explosives, but do no harm, frightfully noisy. See our guns retiring. Don't like our position, as duty not clear. Rest a good deal, but very damp. Battle lulls a bit. Hear things going better. Germans shell part of our wood. Understand situation thus. French pressing up on both flanks, we hold centre. Germans' five corps, one crippled. Many French coming up, but not for two days. Our 6th Division up in three days. More rain, very horrid. Good quantity of rations. Much rain, soaked, a night of absolute misery. Men digging trenches, stand about all night, superintending, men work in reliefs. Withdraw at dawn, CO says trenches are very good, I think so too. We are now prepared to put up a good fight, if division had to retire. There was a sharp affair shortly after dark on our left. It was a regular firework display, with shells bursting, machine guns, etc. Another later on our right, star shell fired. I fancy Germans have searchlights. Morning comes at last, and rain stops a bit. Feel desperate shivers, but a tot of rum makes one better. Sun comes out, rather weak. To our joy, mail comes in, letter and chocolate from Hetty, general rejoicing. Some shrapnel came into wood, and many over. I think aimed at battery behind us. Get some sleep. Feeling rather stiff. Wring out my socks to get rough water out. Battle going on, but quieter than yesterday. Not a bad day, plenty of food. Watched aero. Assisting our shell fire by signals. Bright outside, very cold, much walking up and down. Fairly quiet. Nasty rain. Miserable day of rain, chief events, into wood about 4-30 a.m. Try to make shilling [Scots word shiel - a temporary or rough hut and shieling -summer pasture with hut] A. Q [All quiet?] for some time. Sharp burst of infantry fire about 9 a.m. Few shells come into wood, piece comes to rest near Money. Aero working as yesterday, much shot at. Hear we are to move, as front too thick. Do not move out of wood at dark, rain clearing, feet and legs sopping, very inclined to be depressed. Village full of transport, shelled heavily with high explosive, probably spy, Bucy-le-Long. Move into wood again. After trying night try to improve shelter. Hot tea at Money's fire. What a difference if we could only have a fire, and dry our clothes. (Noticed comet during night to R. of Great Bear). Snails all over place. Fair day. Awful night, rained steadily all time, shelter useless, very cold. Heavy fire during night. Money's fire in morning fans up. 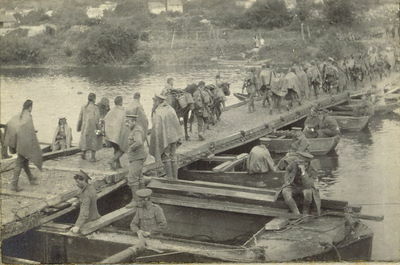 Boat to HQ across Aisne. Get at kits, and get a vest, also a waterproof sheet, and extra jam. Hear attack likely. F. [French] left attack has failed. Night good, but rather cold, have to walk up and down a lot. Men paid. Rain again, heavy showers, got five letters from Hetty at once, also collar, two socks. Shelter some good now, owing to waterproof sheets. Money has been moved. Curious how we harden. Have now been about seven days without taking boots off for any length of time, and feet not dry for nine days, yet no ill effects, bar slight soreness, and cold discomfort. Practice shelter trenches. Mail for 10th Sept. Mails better now. Sent to Septmonts to arrange billets, a difficult job. Bn, [Battalion] arrive very late, difficult to find places again. To bed by 1 a.m., what luxury. On inexpressible comfort of a warm bed. A day of rest, getting dry, washing, shaving. A red-letter day. Hear there was heavy German attack yesterday, and we not entirely successful, also a good deal of loss. Stoppage. Hardinge [Lieut P R Hardinge, Platoon Commander B Company] joined Coy. [Company]. Early to bed. Up at 5-30 a.m. parade 6-45. 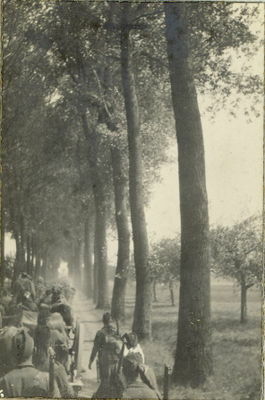 March to Carrière L'Eveque. One of the largest and best kept chateau farms I have ever seen. Draw tools and march to Billz, make entrenchments. Lots of artillery work all day. See aero, chase, and firing, to bed early. Distant [?] Watch to Paris for new glass. Still at Septmonts, lovely day, day of rest. Joy of rest. Visit chateau and church 12th century, very interesting. Aero work. Another beautiful day. Aero, work, Hear we will probably move, hundreds of rumours as usual. V has gone to Paris. The Germans are said to be shooting their own badly wounded. V is back. Watch mended, but a little loose. Aeros. being shot at. Hewitt [Lieut James Francis Hewitt, Platoon Commander A Company, b 23 Jan 1888 - Killed in Action 26 Oct 1914] arrived yesterday. This is four reinforcements, we are now getting too large. Quiet day. Drill in morning. A good deal of shell fire at Aeros. Discipline improving. Hear that the wood we were in received a very heavy shelling. The G's [Germans] have broken down over the compromise [?] shell. Another beautiful day. Watch aeros. At work, much fired at, firing very wild. Route march in morning. Visit Soissons in afternoon. Rough horse. Cathedral still getting occasional shells. Several windows, and some of the building damaged. Almost every other house in the town damaged, spires of arch-church damaged, but place kept very clean, and many inhabitants still living in. Now occupied by the French. One sees beautiful uniform in pictures of war, but in practice they are very dirty. The Algerian troops look very Arab-like. Heard that Hetty has had letter card. A sort of cobweb stuff, which the natives call fil de vierge is falling from the sky, it catches on all the wires, and covers the ground. One sees balls floating in the air. Write several letters in evening. We are five at night in a small room, Lee and I in beds, the rest on straw, on the floor. The couple who own the house are pleasant simple old folk, very willing. The house is only two rooms, and some out buildings. They can get nothing but vegetables to eat. We have had some butter and fresh meat since we have been here. The butter came from Paris, and was a great treat. Because we have an easy time, the men seem to think the war is over, they will probably be rudely awakened from this dream. We cannot stay here much longer, and will probably be pushed up to relieve some roughly-handled brigade. Woken with a scare at 5.45 a.m., dress hurriedly, eat some chocolate and biscuit. Hear Germans are breaking through at Conde. We to take up position in trenches at Cerches. However, hear all well, wash, etc. Church Parade. Our wastage for 14 days, probably 100,000. Germans more. Germans must wear out. Hear our danger at Le Cateau was enormous. Up at 4-30, we must now always stand to arms at 5. Route march. Sleep. Stand to arms. Breakfast at 6-30. Parade 7. Dig gun pits, return 2-45. Bath in pail. Write letters. (Gun pits close to Acy, hear good deal of firing, and two German aeros. over). Slight cold. Improving trenches. See captive balloon, think French. Very cold at the dawn parade, which lasts an hour, but feel every minute. How fortunate to have a house to sleep in. Dig all morning, making fine trenches. Bath. Getting several small luxuries in the feeding line, piece of butter at breakfast, also an egg, country jam at tea time. People always being accused of eating too much. This is the depth to which the war sinks you. Riddell and I have been shooting a little. Only one gun, and very few cartridges are available. Not quite so cold. No letters or parcels. Digging improving trenches. Writing letters, returning maps, working out rosters. There seems to be an idea that Germans are likely to retire, and so we will have to leave our comfortable quarters, however, no one can have any regrets, if it is to push the Germans. I fancy we will move now. Refills have come for this book, which I am very glad of, so shall be able to be fuller. 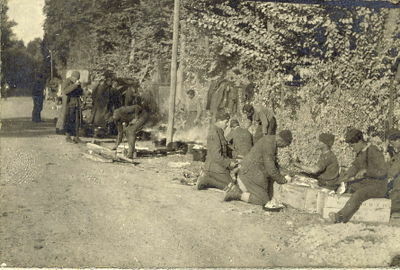 Food is one of the principal pleasures of life during war. We are doing very well now. This is a norm for the day, which does not vary much. Breakfast Bacon, bread, jam. Tea with condensed milk, and sugar. Small piece of butter. (All but bread strictly limited). Lunch. Bully beef in some form, potatoes, bread, cheese, tea (as much as you want, some people excepted owing to special capacity). Tea Bread, very small piece of butter, jam , tea. Dinner. Stew, bully (latterly fresh meat), with vegetables. Stewed apples or pears. Cheese, tea (sometimes rum). To this is sometimes added a luxury, such as an atom of pâté de fois gras, or walnuts. Drink at dinner, red wine with water, but this is now finished. Rise at 4-30 a.m. Stand to arms from 5 to 6 a.m. Wash and shave, breakfast at 7 a.m. Parade at 7-50 a.m. (at O. [Orderly] Room 9 a.m. parade 9-30) return from parade about 12-30 or 1 p.m., lunch at 1 p.m. (in two relays). Then read papers, and eat piece of chocolate (if any), then wash and lie down an hour. Tea at 4-15 p.m. Take a walk with Lee up hill, and view battle. During this walk the subject of war is banned. Return at dusk, and write letters, and diary, till dinner, which is in two relays. First lot at 7-15, second at 8. HQ always second, so go late every third day. Then go to A Coy's [Company's] billet. (A Coy have seceded from the general mess), and play a rubber of bridge. 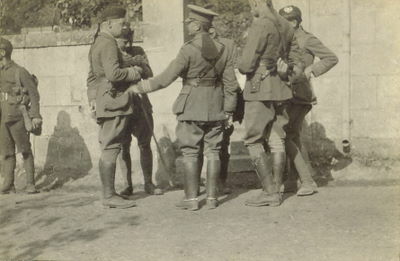 Oakley [Major Richard Oakley, Officer Commanding C Company], Chaplin [Major James Graham Chaplin, Officer Commanding A Company], McLellan [Capt Thomas Rainsford McLellan, Second in Command A Company] and self. Then to bed about 9-30 p.m. Proper bed, and boots off. Five of us in rather small room. Stand to arms as usual, not feeling so well. Fancy a rather bad cold, however, appetite still quite good. Church service at 10 a.m. outside village by chaplain. Guns, some quite close, going all the time. What a coup the Germans would make if they could send a message from 'Whistling Sarah' into the middle of our square. The men call the high explosive shells 'Coal scuttles', as they give off a heavy black smoke. Went for a walk with Lee. Lessons of the War. I was quite wrong about rapid fire. It is invaluable. Most of the German attacks have been washed out in 10 minutes, and it would seem that the stereotyped form of attack which one has been led to believe could take place will be very rare. Defence positions are now taken up with very small fields of fire, the enemy can get fairly close, but the last 100 yards or so are impossible against rapid fire. If fire superiority be gained, which necessitates artillery fire do., then attacks may be successful, or a long infantry do. (In which case ammunition supply will come in.) The German attacks have been attempted, without fire superiority, which we have always heard are fatal. Troops here face each other at 80 yards, but cannot advance. Entrenching is most necessary. Deep narrow trenches are best. Head cover is not liked. Without trenches you would stand no chance. On the Aisne here there are 3 rows of trenches, the 1st if rushed, just lie down and take their chance. No 2. now open fire, and if this were rushed, No. 3 would take it up. The 4th Platoon is allowed complete rest. At night men stand up, alternately, all night in the trenches. Communicating trenches to the rear are most valuable, and in our trenches extra rooms etc. have been dug in supporting trenches. During day time more sleep can be obtained. Much firing is going on to-day. Go walk with Lee after tea. Went with Lee for our usual evening walk, and found an aeroplane, which had come down for some minor adjustment. Motor cars follow our aeros., and watch for their coming down. In the cars are spare parts, and mechanics, who form the R & F [rank and file] of the flying corps. The chief mechanic looked very intelligent. The aviator's name was Lewis. He was flying a B. E [Blériot Experimental] biplane. It was fitted with wireless. L. [Lewis] said he was unable to take an observer, as the wireless weighs too much, therefore, he had to work his machine, send wireless m.s.s. [messages], and observe. He did not seem to think much of the French air service. He said the men who could fly had no discipline, and no military knowledge, and those who were soldiers knew little about flying. He seemed to think that the Germans were good flyers, but they always turn tail if our airmen appear. One of our men was shot, and badly wounded from a German aeroplane. I examined the machine. It had a 70 horse 8 cylinder engine. When the machine is started, the exhausts became red-hot almost at once, it was dark by the time he flew off. He said they would put out flares for him. It looked very pretty with the red-hot pipes, and the coils sparking. The wireless ariel [sic - aerial] is worked by letting down a wire from a reel. Hear rumours we will leave to-morrow night. Blankets issued to men, all sorts. After a short pause with the BEF facing German Forces on the Aisne, there followed a race to the sea. Each side endeavoured to outflank the other by pulling out forces from various parts of the front and redeploying them on the open flank. Ultimately the line was extended to the Belgian coast. 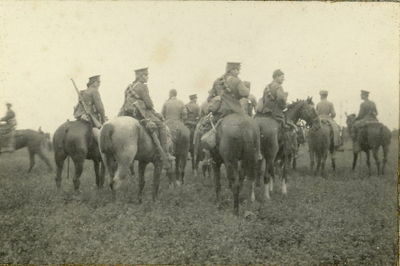 The BEF was relieved on the Aisne at the beginning of October 1914 and redeployed to the area of Ypres where they were engaged in fierce fighting until mid-November 1914. At this stage an unbroken battle line stretched from the sea to the Swiss frontier and the opposing forces engaged in three and a half years of trench warfare. Rise 4-30. Out to dig 8-30. See several German aeros. We have a field gun sunk to fire, but no success. Lots of our aeros. And French about. Something going to happen. About 12 we get order to return to village, and hear we move at night. Lucky that parcels arrive in time, to put in kits, etc. Miss Snowden's shirts etc. distributed. Dinner 5-30. March off about 8. During night pass many lorries, full of French soldiers moving N.W. Arrive at St Remy [St Rémy-Blanzy] about 1-30 a.m., and are told to move into some woods nearby, so as to be hidden all day. Lie down about 2-15. Sleep a fair amount, but rather cold. Drizzle of rain. Belt breaks. First rain since we left last wood, over 14 days ago, but hope not much. We have no idea what we are going to do, but imagine we are to be thrown in somewhere. Germans have a new nasty surprise. Aeros. carry sheafs of thin steel arrows, which spread to a large cone as they drop and pierce anything below like butter. Take over command of 'C' Company. Visit Money. Move out of wood 7 p.m. Flat country, and then very wooded, pretty full moon. Telegraph posts, and crosses a feature. Telegraph posts are made of reinforced concrete. Arrived at Vez, via Corcy and Villers Cotterêts about 4-30 a.m. Difficult wood to get into. Men very dirty. Get greatcoat; sleep a bit, but wake very cold, eat an apple. Pay a visit to chateau, in whose grounds we are, and have some tea, bread and jam with French engineer officers. Wash and shave. Proprietor is anxious about his trees. Visit old castle nearby. I say old, but very much restored. Dates from 14th Century, and evident that proprietor, by name Dru, made it his hobby to restore it to exactly what it was, using old material as far as possible. Beautiful view. Get orders to move off by 6 p.m. Get mail at last moment. Small packet from mother. Glad I said small, as otherwise it would have been difficult to carry. Letter from H. saying registered parcel coming - registered evidently slower. Guns going all over march. Arrive about 11-15 p.m. at Béthisy St Pierre. My bit of wood is rather exposed. Try to sleep, but after about 1½ hours wake up shivering, and stiff with rheumatism. Walk about, but find it very hard to get warm. Becher [Lieut Henry Owen Dabridgecourt Becher, Platoon Commander C Company, b 15 Aug 1889 - Killed in Action 15 Mar 1915] and Rooke [Lieut Charles Douglas Willoughby Rooke, Platoon Commander C Company] come up presently, same cause. We look about for wood, which is very scarce, and start a small fire. Eat some bully, and boil up some Oxo squares in the tin - quite nice. Sleep a little, with feet to fire, and better sheltered place. Shave, etc. Mail issued, and presents from Mrs Girdwood. Move off about 2 p.m. First day march for over three weeks. Move to Pont Sainte Maxence, pass several interesting old houses. Bridge very completely blown down, but replaced by strong barge bridge. Told we would entrain, but orders altered several times. Bed down with Lee, and have a fair night round fire, but cold towards morning. Rather rush leaving. Depart 7 a.m. Arrive Estrèes Saint Denis at 11-15 a.m. Have diners ???? ?, 5 officers, find that they are verminous, probably the result of the blanket carts. Much washing and hunting. One man found drunk. 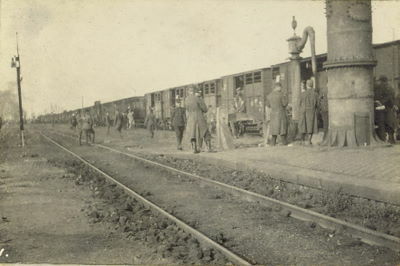 Leave about 5-30 p.m. 40 men in cattle trucks, 8 officers in a carriage. This is nice and warm, and we look on this as a night of luxury. My company is on duty, in case enemy is met have to keep on equipment. Pass Mondidier. Still on train. Pass Boulogne. Arrive at St Omer about 11-30. My company on fatigue, Germans quite near. March about 1 p.m. to Port Rouge. Hear French are building positions in front. Go in motor to see French Colonel and explain, then back to Port Rouge. Hear we are to billet in Renescure. Go in car again to French Col., tell him, then go direct to Renescure. Billet my company in Mr Steven's farm. Dine in chateau. Village crowded with refugees, but shops well stocked. Get some chocolate. Mattress on floor, fair night. Stand to arms at 5-30. Get knife and fork. Chateau picturesque with moat. Move off at 12-10, my Company to go to hold outposts at Le Nieppe. 'B' to rest of battalions Lynde between ??????. I find French building all the posts I am to hold. Have long talk with French Col. Beside ???? position well held, but trenches not deep enough. Get him to let me deepen it by saying men want exercise. Tell C.O. [Commanding Officer] and get permission to go into reserve. Have food in small house, including mushrooms, or what we thought were. Fair night, frost, kaross very wet. [From Capt Rose's service in the South Africa - Kaross ~ Native South African skin mantle] Hurried orders during night. Little late starting, discover wrong road, and correct, just in time. March (B Co. as A. G.) [B Company as Advance Guard] via Hazebrouck. Misty, fix swords to resist possible attack. Sat in field. Move to Borrè, saw shelled houses, one old woman crying. Bivouac. Get kits, also mail and oilskins. Feed in deserted house, very clean, buy a blanket. Move, with many halts to near Strazeele. We forms corps reserve. Rain. After dark go into very close billets in piggy farm, people very pleasant. Get bed. Rise at 2-50 for orders. Turn out, and stand by. With regard to behaviour of Germans, I have not come across many atrocities. They do seem to have done a great deal of malicious damage in deserted houses, and of course some very nasty things, but what can you expect when dealing with a low class in a hostile country. We have had to put down looting on a minor scale, even in our own army, who are so well treated, and in a friendly country. The Curé was shot. I could not find out on what grounds. A French cavalry officer was shot while on patrol, by some civilians on bicycles, presumably spies. A wounded German officer was left in the house I billeted in, and taken over by our ambulance. The Germans are terribly callous about their own wounded. Before the Guard's Brigade the ground was covered with dead and wounded. The Germans refused all offers to have them removed. The stench was awful I am told. 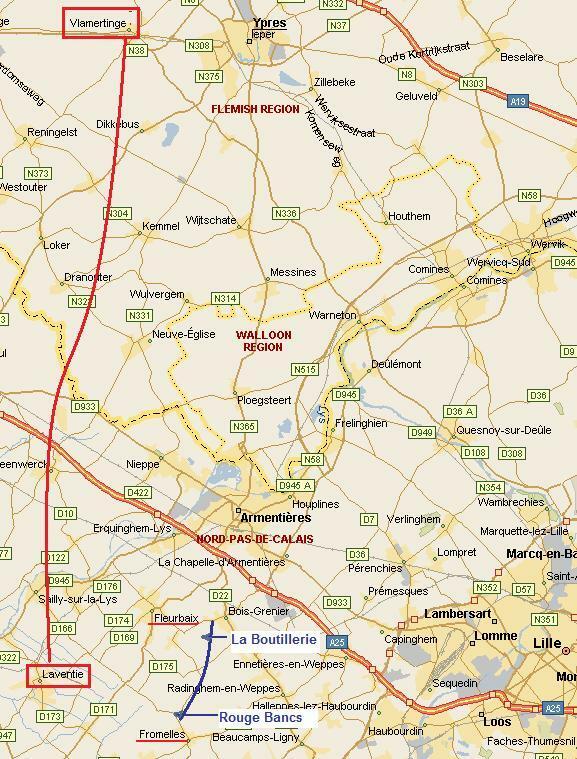 About 12 mid-day we get orders that the brigade will attack Bailleul from Meteren. The Welsh and Argylls leading. March on, only to find Bailleul unoccupied. We make a triumphal march through the town, and hear that the Bavarians had been very drunk, and before retiring broke windows and did 20 atrocities. Just beyond we get a few shots fired at us. We are left of the 6th Division, with 4th on our left. The 6th seems to be held up, and we rather in the air. It has rained on and off since 11 a.m. I am inclined to feel depressed. Hear we are to move back into billets, so make a bet we won't. After dark, move to a field N of B. My Company on duty, and sleeps in equipment, also furnish post. Then quite a good night, as warm, in spite of rain. Up at 3 for orders. Stand to arms 5-30. Stand by 6-30 ??? still standing by, but hear that all danger being over we are to return to army troops. Understand we are to go into billets. Presents of tobacco and dried fruit arrive, from papers and societies. 4 p.m. move off without notice into B,, but alas just as we arrive at billets, informed not going, so out, Eat a piece of bread and jam. I to lead A.G. [Advance Guard], learn up routes. Move to Steenwerck Move into filthy cow field. Very unpleasant night, hardly sleep at all. Breakfast about 5 a.m., standing by. Get a big mail in. Move off at 12-45, my Company to be rearguard Hear some Germans in a cave, but turns out to be only 'cavé' - a cellar, so move on. Darkness comes on, and the bad roads make marching most uncomfortable. About 1-30 reach Vlamertinghe. To great joy, go into billets. Waited on by a quaint fellow. The diary ends at this date. 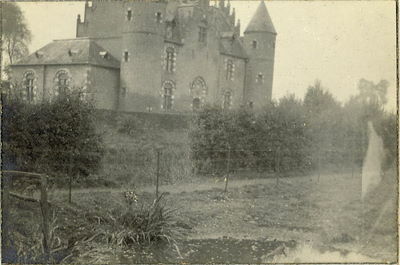 17 Oct - At Vlamertinghe - Remained in Billets and had clean up. 18 Oct - The Battalion were used to experiment in getting into Motor Buses going for an hours run, getting baggage and ammunition packed etc. One platoon gets into 2 buses and each Company got 10 buses leaving one spare. 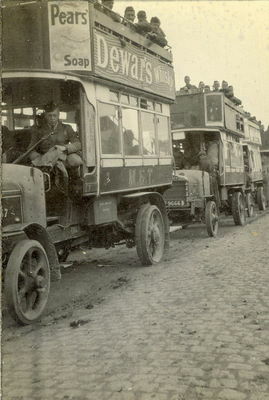 Five buses were required for all baggage, blankets, ammunition etc. 19 Oct - Battalion ordered to move at 2.30 p.m. by motor bus to Levantie, a road distance of 22 miles south, with the other three battalions in the brigade having left by route march at 1.30 p.m.. 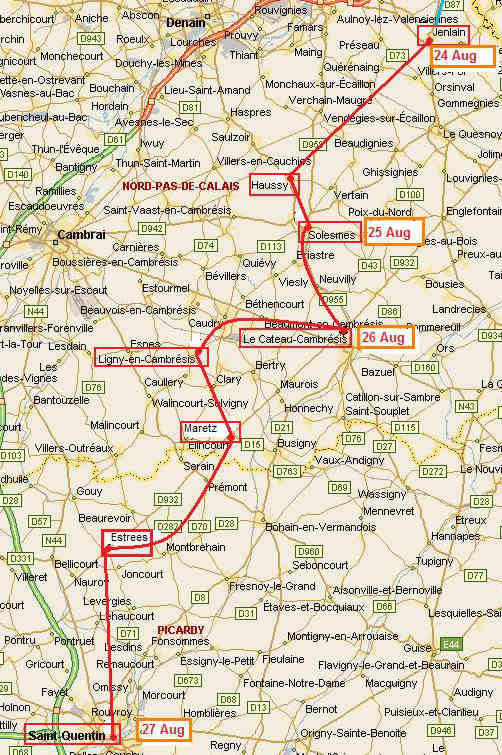 The Battalion's "flotilla of buses did not get in till 8.45 p.m. owing to meeting heavy Ammunition Columns on road (narrow) and also being blocked by French Cavalry baggage at Estaires. The remainder of the Bde got in about 2.30 p.m. next day, Going in Busses (sic) not all 'quite simple'.". 20 Oct - Levantie - 8.30 a.m. The Battalion and the Royal Welsh Fusiliers sent out to entrench a position Fleurbalx - Fauquaint. 1.30 p.m. Brigade marched to Fromelles - Middlesex Regiment and Royal Welsh Fusiliers occupied the town with Argyll & Sutherland Highlanders and Cameronians in reserve. Cameronians bivouaced in a field and had a very wet night. 21 Oct - Fromelles - 5 a.m. Stood to arms 7.05 a.m. marched to Bas Maisnil with Le Maisnil occupied by Argyll & Sutherland Highlanders, Middlesex and Royal Welsh Fusiliers in Fromelles and Cameronians in reserve. 4 p.m. B Company (Capt H H Lee) sent to support Middlesex. 6 p.m. Argyll & Sutherland Highlanders got badly shelled and they and the Middlesex had to retire. 9 p.m. Brigade fell back to La Boutillerie and took up a new position there, with the Cameronians on both flanks. Casualties, all of B Company, 1 killed, 13 wounded, 1 missing. 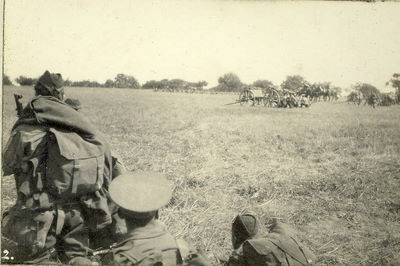 22 Oct - A position reconnoitered by Brigadier and Commanding Officers and the brigade entrenched at 5.30 a.m. Half of C Company under Capt Rose and half of D Company under Capt MacAllan went out as covering party and became engaged at once, the Germans allowing them to get to close range and then opening fire from the flank with machine guns and rifles. "They fell back a little then held on most splendidly." (See family history account below) 6 p.m. Enemy attacked but easily repulsed. 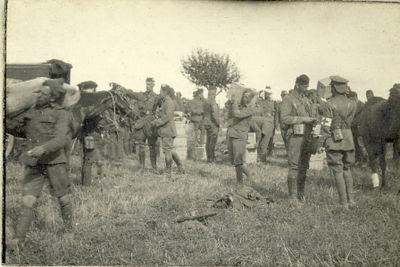 On the 22nd October the battalions of the 19h Infantry Brigade were ordered to entrench on a line extending from Rouge Bancs on the right, to the area north of La Boutillerie on the left, and were deployed with the Royal Welsh Fusiliers on the right, the Middlesex in the centre and the Cameronians on the left. Each battalion held a frontage of some eleven hundred yards. Companies were deployed forward from each battalion to give time for the brigade to establish a defendable firing line. Captain Ronald Rose took half of his C Company forward as covering force for the 1st Cameronians while they dug in; half of D Company was also sent forward. The battalion entrenched under heavy shellfire and C and D Companies became engaged by the enemy, who opened fire from a flank with rifle and machine-gun fire at close range. No artillery support was available, and as the pressure from the German infantry increased during the day, the companies fell back a short distance, taking cover in folds in the ground until nightfall with shrapnel fire directed at them. As the fighting developed towards dusk, Ronald Rose was wounded initially in the ankle, but kept going until he was mortally wounded, having been hit a further two times. October. 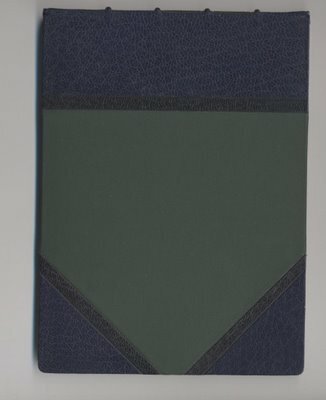 Capt Rose has no known grave but his name is commemorated on the Ploegsteert Memorial to the Missing at Ploegsteert in Belgium and can be found on Panel 5. For most conspicuous bravery near La Boutillerie, on 22nd October, 1914, in voluntarily endeavouring to rescue, under very heavy fire, a wounded man, who was killed before he could save him, and subsequently, on the same day, in carrying a wounded Officer a distance of 300 yards into safety whilst exposed to very severe fire. As a result of viewing the Capt Rose War Diary on the Historylinks website (http://www.historylinks.org.uk), on 7 February 2011 Mrs Stella Barber (nee Honeyball) contacted the museum seeking contact with the descendants of Capt Rose. She said that her father, who served in the Cameronians during WW1, was actually holding Captain Rose, trying to move him to safety after he was first injured, when the Captain got the second shot that killed him. Her father was then shot and injured and whilst convalescing in Scotland he was able to write an account of what happened on Oct 22 1914 from his diary.Mrs Barber was linked with the Mrs Carol Haq and provided Historylinks with a copy of 'My Life & Experience in the Army 1906 ….1918' by her father Arthur Charles Honeyball. With her permission an extract from her father's account can now be added as a postscript to the War Diary of Captain Rose. Extract from 'My Life & Experience in the Army 1906 ….1918' by her father Arthur Charles Honeyball. "In the division we were in was the Argyle and Sutherland Hrs. the Middlesex Rgt. and Royal Welsh Fusiliers, and every day each regiment takes it in turns of leading the column. It was 21st October, and the A.+ S.H. were in front, and we were second. That night the Argyles got shelled, they had a few killed and wounded, as also did my regiment. We went into a field and built head cover in case of attack, but the enemy drew off. 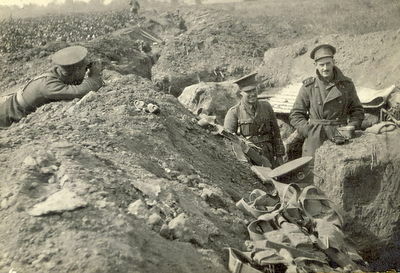 Early next morning my company was sent out as a covering party, so the company in rear could did trenches. We went to the front for about 800 yards, and we got to some wire fencing, the enemy opened fire on us, my platoon was on the left of the road, and we got it thick, I shall draw, or rather make a small sketch of our position we went into. We had a good many killed and wounded and the enemy was too strong for us to check their advance, so we had to retire. "So my platoon retired to a barn about 100 yds away and we placed the wounded behind a hay-stack. Captain Rose told me to stay with the chaps that were wounded and he retired with the company another 100yds further back into a ditch. I bandaged a couple of chaps up that had got shot in the leg, and a chum of mine Sgt Sadler was shot in the abdomen. I done what I could for him, but he succumbed to his wound. I tried to get a message from him but he could not speak. Soon after that, a man named Potter came back and he said that he was sent to look after the wounded, so I went back to where Captain Rose was. We then retired from the ditch for about 50 yds. because the Germans were advancing again and we were not strong enough to hold them, Captain Rose said that he would see where we could retire to next time, and as he looked round he was shot in the back. I, and another young chap that was near, went over to Captain Rose and as I got up my rifle was hit, the stinging sensation made me drop it quick. I thought I was shot in the arm at first, when we got to Captain Rose I asked him where he had got it , he said in the back, as soon as he said that, he got another that killed him. I had got hold of him by the feet, and the other chap had got hold of his shoulders, by the time he got the second shot. And then I got mine through the thigh. I must have fainted after that, because when I came to my senses I was in a ditch and no one seemed near me, and I did not know which way to go. The shots were whizzing overhead, and then there was a lull in the firing, so I thought I would look and see if I recognized anything. I then knew which way to go. "I was dragging myself along, when I caught sight of a house, so I thought if I could manage to get there I might be alright. So I kept on and it seemed like hours, although the distance was not more than 500 yards from where I was wounded. I got to within 50 yards of the house when I caught sight of some of my regiment in the trenches they had made. When I saw them I said "Thank God" Mr Rooke a young Lieutenant came and helped me up to the house that I was trying to get to, then he called the stretcher bearers and they carried me back to where the doctor was, and even then we were not out of danger, a "Jack Johnson" came over and killed 2 ammunition ponies, also the doctors horse. "I was wounded at 10am. 22 October, and I left the place where the doctor was about 6pm. I was taken to the Field Hospital for an injection to prevent blood poisoning, from there I was taken to the train at Ballral Station, from there I went to Bologne, from there I crossed to Southampton on the Yacht 'Albion' a very nice yacht lent to the government by a Mr Loufler of London. I was taken to Cambridge Hospital Aldershot. "When I was well enough to be moved I was sent to Thorncombe Military Hospital Bramley Surrey. "This place is a private house belonging to Colonel Fisher Rowe of the Grenadier Guards, I soon got better and I received 14 days sick furlough.